Spend three days in the pitcuresuqe hills of the Thachi Valley and combine a trek to the Gaun Beed Waterfall with short treks to explore a range of local destinations in Thachi. On the trek to Gaun Beed, you'll make your way through dense wilderness to stumble upon a hidden waterfall. From atop the high mountain cliff, the waterfall appears to be flowing down from the clouds. You'll also hike to the Gaun Beed plateau, trek to Hadima peak, visit the Bithu Narayan temple, dip your feet into the Ashu Alli water stream and spend some time at the Ropa pond. An outdoors adventure over rustic trails, you'll stop at vantage points along the way and spend the night in tents surrounded by apple orchards. NOTE: A minimum of 5 travellers are required to book the Gaun Beed Waterfall trek. Gaun Beed, the mainstay of this trek, is a towering waterfall that is hidden deep in the folds of mountains. Near the waterfall is the namesake Gaun Beed plateau, a great vantage point to catch bright views of the valley. • Trek to Gaun Beed Waterfall and explore the Thachi Valley. 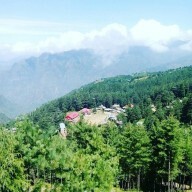 • Go on short treks to nearby temples, peaks and grasslands. 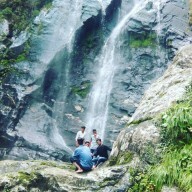 Consumption of liquor, drugs, tobacco products and cigarettes is strictly prohibited during the trek to Gaun Beed Waterfall. For cancellations made more than 7 days before departure of the Gaun Beed Waterfall trek: 90% refund. For cancellations made 7-2 days before departure of the Gaun Beed Waterfall trek: 80% refund. For cancellations made less than 2 days before departure of the Gaun Beed Waterfall trek: 60% refund. Travellers are requested to report at the campsite by 11:00 hrs on Day 1, and depart from the campsite by 15:00 hrs on Day 3. However, these check-in and check-out timings are reasonably flexible. The tour operator takes utmost care to ensure safety of the travellers and shall not be held responsible for any mishap or accident during the trek to Gaun Beed Waterfall. There is no pick-up for this Gaun Beed Waterfall trek. There is no drop-off for this Gaun Beed Waterfall trek. Arrive at the campsite by 11:00 hrs. After spending some time resting in your tents, you'll meet your trek leader and venture out to explore the valley. Your destinations for the day include the Hadima Peak and the Bithu Narayan Temple. En route, you'll stop at vantage points to admire beautiful panoramas. Return back to the campsite by evening, after a day spent trekking to local temples, waterfalls and view points in the Thachi Valley. Overnight at Ropa campsite in tents. Day 2 of the Gaun Beed Waterfall trek: Trek to Gaun Beed Waterfall! Rise and shine to an early morning sunrise over the Thachi Valley. Today, you'll trek to the Gaun Beed Waterfall and plateau. En route, you'll also stop and spend some time at the Ashu Alli water stream. Trekking on a trail densely cluttered with shrubs and trees, you'll arrive at the Gaun Beed Waterfall. Continue trekking to explore the surrounding Gaun Beed plateau and return back to the campsite by evening. Overnight at Ropa campsite in tents. Wake up to your last day of the trip. Today, you'll visit the Ropa Pond. A crystal clear pond located besides an ancient temple, you can take some time to relax on the banks of the pond before returning back to the campsite by early afternoon. You'll check-out of the campsite by 15:00 hrs. Depending on availability, you can also extend your stay at the campsite for an additional cost. Your trip ends here. Arrive at the campsite and trek to local temples, waterfalls and peaks. You'll be accommodated in tents on quad/multi-sharing basis. Sleeping bags and mattresses will be provided for a restful night's sleep. Today's meal pacakge includes a packed lunch while trekking and dinner at the campsite. All meals will be vegetarian. Check-in and check-out times are reasonably flexible. Trek to the Gaun Beed Waterfall and plateau and return back to the campsite. You'll be accommodated in the same tents as yesterday. Today's meal package includes breakfast and dinner at the campsite and packed lunch while trekking. All meals will be vegetarian. Gather around a crackling bonfire at night. Trek to local meadows and grasslands before checking out of the campsite. Today's meal package includes breakfast at the campsite and packed lunch while trekking. All meals will be vegetarian. Depending on availability, you can even extend your stay at the campsite for an additional cost. Check-in and check-out times are reasonably flexible. Colourful overviews of the campsite.